You'll be £32.00 closer to your next £10.00 credit when you purchase Allied Coastal Forces of World War II. What's this? Order within the next 7 hours, 13 minutes to get your order processed the next working day! The major contribution made by Coastal Forces to the Allied war effort has had surprisingly little coverage in the literature of the Second World War. Motor torpedo boats, PT boats, motor gunboats, launches and submarine chasers served with distinction throughout the War, and in every theatre. They performed invaluable service as patrol boats, convoy escorts, minelayers and minesweepers, harbour defence vessels, light landing craft, RAF rescue boats and transports for agents and clandestine missions. Allied Coastal Forces, now a recognised classic work and first published in 1990, remains the only publication to deal comprehensively – in words, photographs and drawings – with the technical detail of all these boats. Design, construction and subsequent development are all covered, and the builders, construction lists, fates and the technical data are given for each type. Separate sections cover armament and equipment, sea-going qualities and habitability. 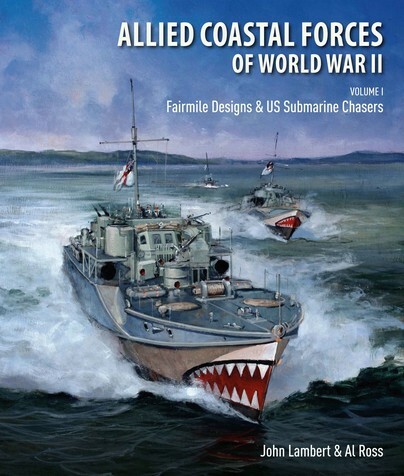 This first volume covers all the designs of the Fairmile Marine Company (including those craft built and equipped for Canada), together with the 72ft Harbour Defence Motor Launch and the US Navy 110ft subchaser. The authors, firmly established as the recognised authorities on small warships, unearthed a remarkable body of information now included in this major work, and their finely detailed drawings, redrawn form original builders’ plans, offer an unparalleled view of all these remarkable designs. The new editions of their work will be welcomed by naval enthusiasts and modellers alike. Over 250 pages packed with an amazing level of detail and a degree of research effort that can only be admired. Anyone with an interest in Coastal Forces, veterans, historians and modellers, this is a reference I think should really be on your reference bookshelf. I can't recommend this one highly enough. As someone who has always admired the lines of the Fairmile Dog boats, this book is a delight. There is literally no aspect of the Fairmile range of Coastal Forces craft that isn’t covered. The early Fairmile A proved to be too slow to tackle E boats and they evolved into the heavily armed D Class with at least 2x6 pdr main armament, 4 torpedoes, twin 20mm and machine guns. The D Class were “the most potent and heavily armed coastal forces” of any navy. With a range of over 500 miles, it is worth pointing out that they carried over 5000 gallons of petrol with no armour. The book has exhaustive details of construction including technical drawing; literally no detail is omitted. Sections on the individual types weapons, radar and engines are similarly detailed – I almost felt I could have done an oil filter change the drawings were so detailed. As these craft became more heavily armed, crew conditions were increasingly cramped. A section on habitability is a marvellous piece of understatement. Habitability in these small craft was always going to be a test – this was before the days of lightweight Goretex foul weather gear. The CO who filled his seaboots with warm water on the basis that if he was going to get wet, he might as well be warm is brilliant. The builders of these craft were small boatyards throughout the country. Many of them were peacetime yacht builders and in one case the woodwork was French polished not varnished. The book has been supported by the Coastal Forces Veteran’s Association and their input is very evident. The photos are superb and the publishing standard is equally high. My only comment is that a photo of HMS Hornet talks of “Suicide Bridge” over Haslar Creek – I always knew it as “Pneumonia Bridge”! This book is fitting testimony to some extremely brave young crews who were mostly volunteers. Very highly recommended. THIS encyclopaedic work examines Fairmile Motor Launch (ML) designs, Harbour Defence Motor Launches (HDML) and the US Submarine Chaser (SC) 497, their weapons, sensors and equipment. Every ML is listed, together with its in-service dates and production statistics by boatyard. The book was first published in 1990 with Seaforth Publishing making it available again in 2018. The authors, John Lambert and Al Ross, firmly established and recognised authorities on small warships have included a remarkable body of information, together with their finely detailed drawings, redrawn from the original builder's plans, to offer the reader an unparalleled view of these remarkable vessels. For many years JOHN LAMBERT has been known for his highly detailed plans of smaller warships, their armament and fittings, but he has also produced a number of books written around these plans, most recently two ‘ShipCraft Specials’, on Flower Class Corvettes and Allied Torpedo Boats.